Try copying Luke's beautiful sketches and painting to create your own drawing of this colorful, highly social but increasingly rare member of the finch family. If you'd like, add some color when you're done. And feel free to share a photo of your art with us! Photograph taken by Craig Neff at the Maine cabin of the great naturalist, biologist and writer Bernd Heinrich—an evening grosbeak mecca. Below is a copy of Luke's original art showing different perspectives and close-ups of an evening grosbeak (whose name means "large beak"). Study it and think about whether you would like to draw the entire bird or just one part. Get your pencil and eraser ready...and try to copy what you see. It's a great way to learn. 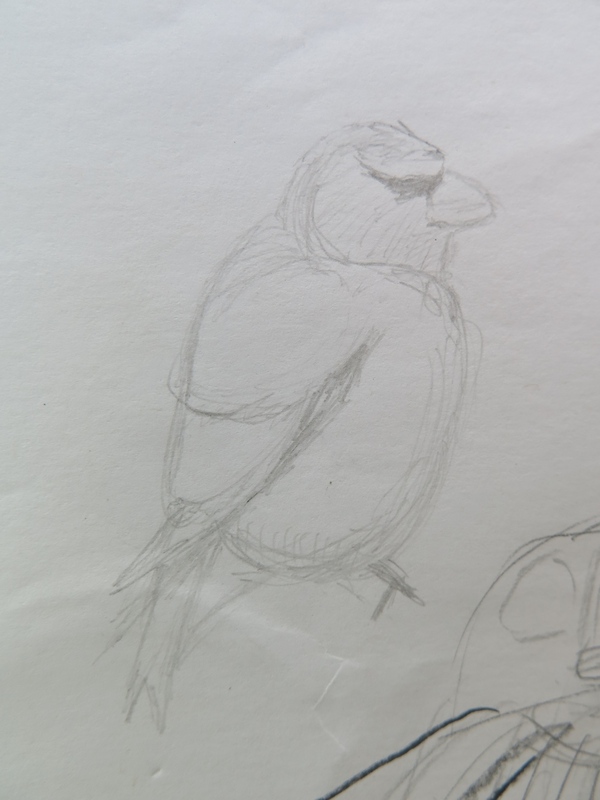 Below is a quick slide show of several of the many grosbeak drawings that visitors have done at The Naturalist's Notebook Annex in Northeast Harbor using Luke's example. We would love it if you emailed us photos of an evening grosbeak you end up drawing (or painting or coloring). Send them (and a photo of yourself drawing too, if you wish) to info@thenaturalistsnotebook.com and we'll add them to the slide show. Just have fun with it and see if you learn something about evening grosbeaks and bird feathers in the process!